I met Sue Soaring Sun in December of 2014. She’d seen me repeatedly at the coffeeshop in the small Southwest town where we were both wintering and intoduced herself. An hour later when we ran into each other again in the thrift store, she told me about Bob Wells’ Cheap RV Living website. I soon learned about the Rubber Tramp Rendezvous and decided to attend. I guess you could call Sue my rubber tramp fairy godmother because she introduced me to vandwelling as a way of life and not just something I had to do because I had few options. Sue is also my Sun sisiter, a fellow artist and blogger, a writer of fabulous letters, and a dear friend. She is the proprieter of Sun Gallery at 407-1/2 N Broadway in Truth or Consequences, NM. Sun Gallery is a folk art and antiques gallery which features Sue’s paintings, collages, and mosaic work. We were in different states when I started this interview series, so I sent her questions via email. Today you’re in for a treat because you get to read her answers. You’re not a vandweller, but you do live nomadically. How long have you been on the road? I’ve been living and traveling in an RV more often than not since February 14, 2011. What sort of rig do you live and travel in? I have had Brownie, a 1984 20-foot Lazy Daze mini-motorhome, for about 14 months. I know you’ve had other rigs. What were they and why did you decide against them? I’ve had a couple of Toyota Dolphin 22-foot mini-motorhomes, and they were great for when I travel solo, which is most of the time. Sometimes, though, I travel with my boyfriend, and I wanted something that would work for two. We tried a Class A for a while, but found it was way too much for either of us to want to drive, so we parked it and used it as a part-time urban home base. Last year I found the Lazy Daze which has a lot more power and is about a foot taller and wider than the Dolphin coach. Even though it’s shorter, it’s a bit more spacious. Now I’m selling the Class A. I no longer want to use it as a home base. I have an art gallery that serves that function. So I’m staying in the Lazy Daze all the time, except for if I happen to housesit or stay in a vacation rental. What are your three favorite things about your current rig? What would you change about it if you could? This is how Sue has been decorating the inside of her rig to make Brownie less brown. She gave me permission to use this photo of hers. *I love the big back windows, and my floorplan has the dinette right there. I can back up to a beautiful lake or river or other view and watch birds and other wildlife from the comfort of my table, drinking coffee and wearing my cozy slippers. *It has more power and feels more solid than my past mini-mohos. I can pass other vehicles if necessary. *It is very cool looking. Shagalicious, baby. What I’d change…it is very brown inside, hence the name Brownie. I am slowly replacing brownness with color and creativity. Also, Brownie takes a lot of gas. I have to budget more carefully than I used to. 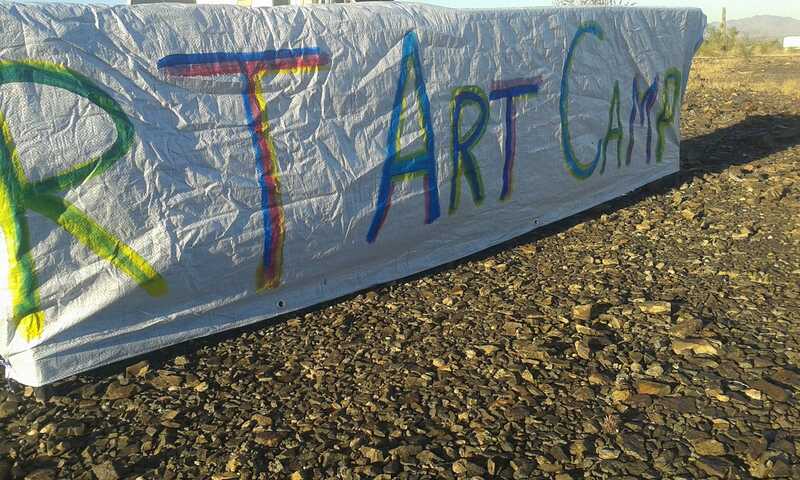 I took this photo of the RTArt Camp banner that Sue and I painted together. How does living nomadically enhance your life as an artist? Whoo-boy! Living nomadically goes hand-in-hand with my creativity. I’m sure when I’m old and can no longer travel, I will still make art. But so much of what I do now is inspired by what I see and the experiences I have along the road. 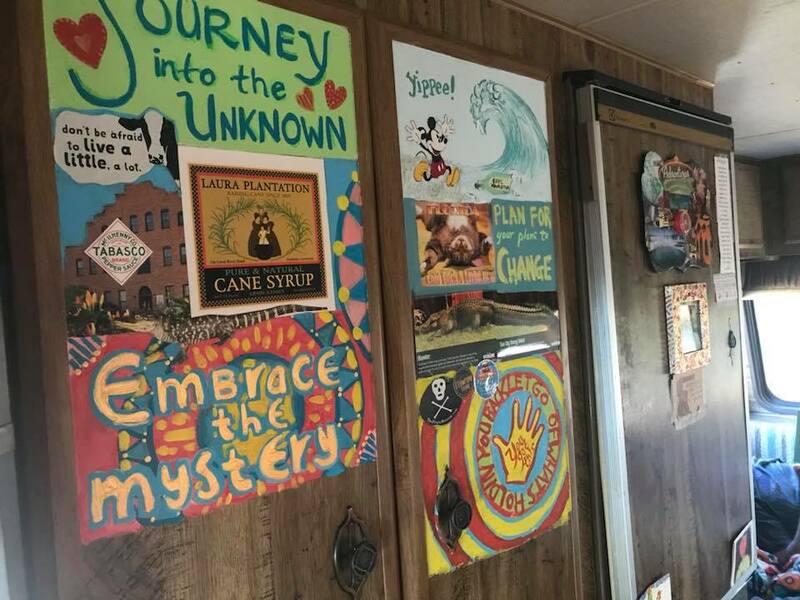 Traveling has brought me in touch with so many other artists, and now, since the first RTArt Camp at this year’s Rubber Tramp Rendezvous (RTR), we have even started an intentional community for nomadic artists. Imagine that! I could not have predicted all that would come out of a simple idea of wanting to do art with other people while at the RTR. When I spend time camping with other artists, I am inspired. After our recent Rubber Tramp Art Community gathering, I stopped at a beautiful free boondocking site and spent five days doing nothing but paint, eat and sleep. Does living nomadically make your life more challenging in any ways? Yes. I have struggled in my new rig to deal with temperature extremes. 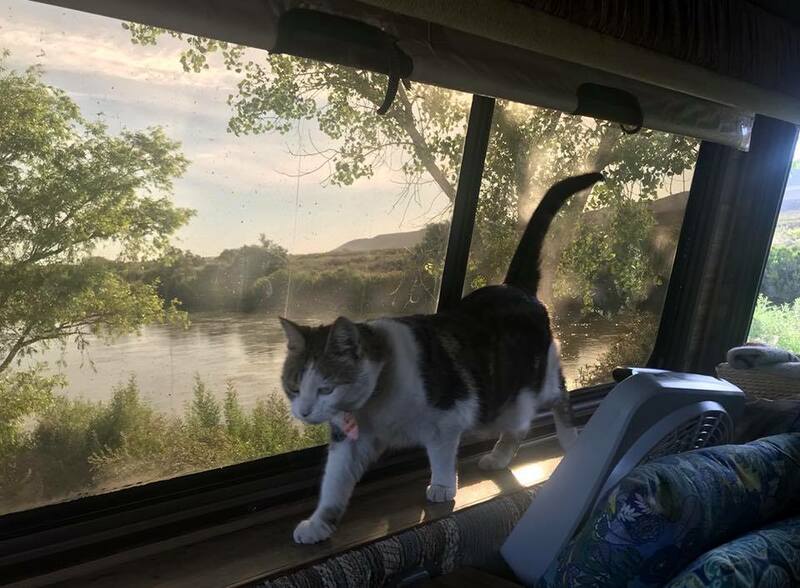 This summer, I found myself unexpectedly staying in Truth or Consequences, NM, and I could not find any good way to keep my cat and myself cool in the RV. Fortunately, a friend who goes away for the summer let me stay at her house. Next summer, I will probably seek a higher elevation, as I had wanted to this year. I gradually solved my problems with cold last winter, but it took a while. Also, it can be very inconvenient and expensive when I have to go stay somewhere else if my rig is in the shop. Do you mostly boondock on free public land? Yes. I also stay behind my art gallery, in a parking lot. I can hook up to electricity there. I took this photo of this free riverfront boondocking area where Sue and I camped together. Under what circumstances do you pay for a campsite? I sometimes pay for a campsite or an RV park site when I have a lot of things I’d like to get done…shower, laundry, dumping the tanks, etc. I’ve also stayed at campgrounds when my boyfriend and I are traveling together in parts of the country where you usually need reservations, such as our recent trip to Florida. And occasionally I have friends who want to go stay at a campground, and I tag along for the fun. Do you do much stealth parking in cities? My Lazy Daze is built on a Chevy G30 van chassis, but it doesn’t look like a van! It’s built out into a motorhome. So no, I can’t get away with it. No. I rent commercial space that I use as an art gallery and studio. I keep most of my art supplies there, as well as off-season clothing and things that I only use occasionally. Sonja Begonia in Brownie’s big back window. Photo used with Sue’s permission. You share your rig with a cat companion. Has she been on the road with you her whole life? If not, how did you help her transition to life on the road? Sonja Begonia was about a year old when I got her in 2008, and I went on the road in 2011. She also has some attitude, so I could not get her leash-trained before starting to travel, as I’d hoped, nor since. At first, for her own safety, I had to keep her in a kennel while traveling because otherwise she would try to get out of the RV when we stopped, and many stops are not a safe place for a pet to get out. Now I just start the engine and she gets in her co-pilot seat. What’s the best part of living nomadically? 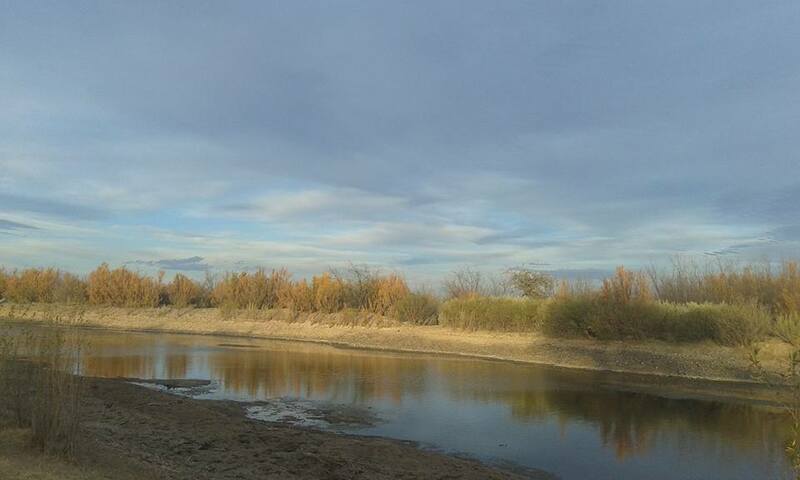 I love driving six miles from my art gallery and boondocking on the bank of the Rio Grande. Or, when I’m on the road, finding an unexpected fantastic view. It’s being free to change my scenery, and to be immersed in it. I keep my gallery open very part-timey and give myself lots of time to travel and create. Do you miss anything about living in a sticks-n-bricks? Gardening. I like centering myself by digging in dirt. So, at my gallery, for one or two months out of the year, I create fairy gardens for sale. I am also going to get myself a dashboard/cab plant once the 100+ degree weather has passed this summer. I don’t miss any other thing, not one. I get to experience sticks-n-bricks living occasionally, and it always confirms for me that I prefer to live nomadically.